The safest – most effective skin care option. It brings out the skin’s suppleness and softness. We only use natural & organic high quality clays, cleansers, muds, exfoliators, moisturizers & skin care products for our facials. Great for all skin types – anti-aging, nourishes the skin, helps heal imperfections & provides a deep cleanse & purification. It rejuvenates & revitalizes the skin making shine like a bride! We offer various non-invasive, nourishing & hydrating herbal facial treatments. Ideal for sensitive skin, dry skin, oily skin, mature skin, combination skin & anti-aging. Each facial is customized for every client. Depending on the skin type and the client skin care goals. 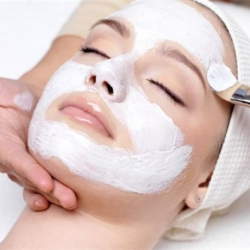 Please note, all of our facial treatments are non-invasive, natural and organic. We do not do extractions. Having extractions done can be harmful to the skin because they can weaken the skin, decrease skin’s elasticity, and cause broken blood vessels. We now offer Back Facials – It’s a way of exfoliating an area that you cannot get to on your own. This treatment will cleanse, exfoliate the dead skin, hydrate and deep moisturize the back to reveal smoother, softer and clearer skin.